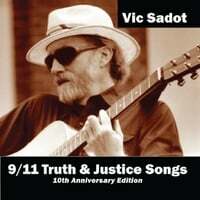 Licensed for use on “9/11 Truth & Justice Songs” released on 9/11/11. This version of Phil Ochs’ 1966 classic is updated for 2011 “liberal” posturing. Of course, there are many liberals who live by their beliefs. This is not about them. The first link below is to the album at CD Baby. The second link below is for the free mp3 of this song at Last FM. I thought it was such a disgrace! There are “lone nuts” all over the place! So love me, love me, love me! I’m a Liberal! GW was a national disaster! And Cheney, a national disgrace! Using big lies and terror and torture! To wage wars and put puppets in place! But I cheered when Obama bombed Libya! Cause killing was correct in that case! Though he sold out to AIPAC and the Banksters! I’m sure our rights won’t be ignored! And he won’t talk about Revolution! Or a Health Plan that’s just and assured! They are Muslims! So they are to blame! I hope the cops take down your name! I feel like I’m almost a Jew! There’s no one more red, white, and blue! They want UN Troops to be strong! He sure gets me singing those songs! But I send my best wishes along! And that’s why I’m turning you in! Previous Post Tell John Yoo That Torture Is A Crime!